Within nations occupied by the Axis Powers in World War II, some citizens and organizations, prompted by nationalism, ethnic hatred, anti-communism, antisemitism, opportunism, self-defense, or often a combination, knowingly collaborated with the Axis Powers. Some of these collaborators committed war crimes, crimes against humanity, or atrocities of the Holocaust. Collaboration has been defined as cooperation between elements of the population of a defeated state and representatives of a victorious power. Stanley Hoffmann subdivided collaboration into involuntary (reluctant recognition of necessity) and voluntary (exploitation of necessity). According to Hoffmann, collaborationism can be subdivided into "servile" and "ideological"; the former is deliberate service to an enemy, whereas the latter is deliberate advocacy of cooperation with a foreign force which is seen as a champion of desirable domestic transformations. In contrast, Bertram Gordon uses the terms "collaborator" and "collaborationist", respectively, in reference to non-ideological and ideological collaborations. The term "collaborator" has also been applied[by whom?] to persons, organizations, or countries that were not under occupation by the Axis Powers but that ideologically, financially, or militarily, before or during World War II, supported Nazi Germany, Fascist Italy, or World War II-era Imperial Japan. After the Italian invasion of Albania, the Royal Albanian Army, police and gendarmerie were amalgamated into the Italian armed forces in the newly created Italian protectorate of Albania. A fascist Albanian Militia was also formed and in the Yugoslav part of Kosovo they established Vulnetari (or Kosovars) a volunteer militia of Albanians from Kosovo. Ethnic Albanian elements of the Italian armed forces participated in the Italian invasion of Greece, and German-led Axis invasion of Yugoslavia. After the capitulation of Italy, the Germans stepped in and established more collaborationist units such as police volunteer regiments and a national militia. In annexed Kosovo, the Germans established the Kosovo Regiment out of Balli Kombëtar forces. In April 1943, Reichsfuhrer-SS Heinrich Himmler created the 21st Waffen Mountain Division of the SS Skanderbeg (1st Albanian) manned by Albanians and Kosovar Albanians. By June 1944, its military value against the Albanian and Yugoslav Partisans was considered poor, after the German occupation of Albania and the creation of the Albanian client state, by November 1944 it had been disbanded. The remaining cadre, now called Kampfgruppe Skanderbeg, was transferred to the Prinz Eugen Division where they successfully participated in actions against Josip Broz Tito's partisans in December 1944. The emblem of the division was a black Albanian eagle. At least four, and possibly five, Australian prisoners of war in Axis custody volunteered for the British Free Corps (BFC), a Waffen-SS unit. Three of the four men whose identity is known were members of the Second Australian Imperial Force's 2/32nd Battalion, and the other was a merchant seaman. Following the war the three soldiers claimed that they had joined the BFC as part of attempts to escape from German custody, and the merchant seaman stated that he had been given a choice of either signing up for the Corps or being imprisoned in a concentration camp after a relationship with a German woman was revealed. One of the soldiers and the seaman were convicted of aiding the enemy and imprisoned after the war, and the other two soldiers were not punished. Belgium was invaded by Nazi Germany in May 1940 and remained under German occupation until the end of 1944. Political collaboration took separate forms across the Belgian language divide. In Dutch-speaking Flanders, the Vlaams Nationaal Verbond (Flemish National Union or VNV), an authoritarian party and part of the pre-war Flemish Movement, became a major part of the German occupation strategy and VNV politicians were promoted to positions in the Belgian civil administration. VNV's comparatively moderate stance meant that it was increasingly eclipsed later in the war by the more radical and pro-German DeVlag movement. In French-speaking Wallonia, Léon Degrelle's Rexist Party, a pre-war authoritarian and Catholic Fascist political party, became the VNV's Walloon equivalent, although Rex's Belgian nationalist stance put it at odds with the Flemish nationalism of VNV and the German Flamenpolitik. Rex became increasingly radical after 1941 and declared itself part of the Waffen SS. After the German invasion of the Soviet Union, Rex helped support the creation of a military unit to fight alongside German troops on the Eastern Front, the Walloon Legion, and a similar Flemish Legion was created in Flanders. Both began as formations in the German regular army but would eventually become part of the Waffen SS. Although the pre-war Belgian government went into exile in 1940, the Belgian civil service was left in place for much of the occupation. The Committee of Secretaries-General, an administrative panel of civil servants, was created to coordinate the state's activities and, although it was intended to be a purely techocratic institution, has been accused of helping implement German occupation policies. The Belgian police have also been accused of collaborating during the occupation, especially in The Holocaust in Belgium. The Japanese invasion was assisted by Burmese nationalists known as Burma Independence Army, who hoped for independence. They were later transformed into Burma National Army as the armed forces of State of Burma. Minority groups were also armed by Japanese, such as the Arakan Defense Army and the Chin Defense Army. The Japanese set up several puppet regimes in occupied Chinese territories. The first of which was Manchukuo in 1932, followed by the East Hebei Autonomous Council in 1935. Similar to Manchukuo in its supposed ethnic identity, Mengjiang (Mengkukuo) was set up in late 1936. Wang Kemin's collaborationist Provisional Government of the Republic of China was set up in Beijing in 1937 following the start of full-scale military operations between China and Japan, another puppet regime was the Reformed Government of the Republic of China, setup in Nanjing in 1938. The Wang Jingwei collaborationist government, established in 1940, "consolidated" these regimes, though in reality neither Wang's government nor the constituent governments had any autonomy, although the military of the Wang Jingwei Government was equipped by the Japanese with planes, cannons, tanks, boats, and German-style stahlhelm (already widely used by the National Revolutionary Army, the "official" army of the Republic of China). The military forces of these puppet regimes, known collectively as the Collaborationist Chinese Army, numbered more than a million at their height, with some estimates that the number exceeded 2 million conscripts. Great numbers of collaborationist troops were men originally serving in warlord forces within the National Revolutionary Army who had defected when facing both Communists and Japanese as enemies. Although its manpower was very large, the soldiers were very ineffective compared to NRA soldiers due to low morale for being considered as "Hanjian". Although certain collaborationist forces had limited battlefield presence during the Second Sino-Japanese War, most were relegated to behind-the-line duties. The Wang Jingwei government was disbanded after Japanese surrender to Allies in 1945, and Manchukuo and Mengjiang were destroyed by Soviet troops in the invasion of Manchuria. With the German annexation of Czechoslovakia between 1938 and 1939, the country was divided. Most of the Czech part of pre-war Czechoslovakia was reconstituted into Bohemia and Moravia, a protectorate of Nazi Germany. The Protectorate had its own military forces, including a 12-battalion 'Government Army', police and gendarmerie. The majority of the 'government army' was sent to northern Italy in 1944 as labor and guard troops. Whether or not the Government Army can be considered a collaborationist force has been debated. Its commanding officer, Jaroslav Eminger, was tried and acquitted on charges of collaboration following World War II, some members of the force engaged in active resistance operations simultaneous with their service in the army, and – in the waning days of the conflict – elements of the army joined in the Prague uprising. The Slovak Republic (Slovenská republika) was a quasi-independent ethnic-Slovak state which existed from 14 March 1939 to 8 May 1945 as an ally and client state of Nazi Germany. The Slovak Republic existed on roughly the same territory as present-day Slovakia (with the exception of the southern and eastern parts of present-day Slovakia). The Republic bordered Germany, the Protectorate of Bohemia and Moravia, the German-occupied Poland, and Hungary. At 04:15 on 9 April 1940 (Danish standard time), German forces crossed the border into neutral Denmark, in violation of a German–Danish treaty of non-aggression signed the previous year. After two hours the Danish government surrendered, believing that resistance was useless and hoping to work out an advantageous agreement with Germany. As a result of the cooperative attitude of the Danish authorities, German officials claimed that they would "respect Danish sovereignty and territorial integrity, as well as neutrality." The German authorities were inclined towards lenient terms with Denmark for several reasons which allowed Denmark a favorable relationship with Nazi Germany. The government remained intact and the parliament continued to function more or less as it had before, maintaining control over domestic policy. Danish public opinion generally backed the new government, particularly after the fall of France in June 1940. Prior to, during and after the war Denmark enforced a restrictive refugee policy and handed Jewish refugees that managed to get over the border over to German authorities. 21 such incidents are known and 18 of the people transferred to German custody later died in concentration camps, including a woman and her three children. In 2005 prime minister Anders Fogh Rasmussen officially apologized for these policies. Newspaper articles and news reports "which might jeopardize German-Danish relations" were outlawed. Following the German assault on the Soviet Union on 22 June 1941, German authorities demanded that Danish communists be arrested. The Danish government complied and directed the police to arrest 339 communists using secret registers. Of these, 246, including the three communist members of the Danish parliament, were imprisoned in the Horserød camp, in violation of the Danish constitution. On 22 August 1941, the Danish parliament passed the Communist Law, outlawing the communist party and communist activities, in another violation of the Danish constitution. In 1943, about half of the imprisoned communists were transferred to Stutthof concentration camp, where 22 of them died. On 25 November 1941, Denmark joined the Anti-Comintern Pact. On 29 June 1941 Frikorps Danmark (Free Corps Denmark) was founded as a corps of Danish volunteers to fight against the Soviet Union. Frikorps Danmark was set up at the initiative of the SS and National Socialist Workers' Party of Denmark (DNSAP) who approached Lieutenant-Colonel C.P. Kryssing of the Danish army shortly after the invasion of the USSR had begun. According to Danish law, it was not illegal to join a foreign army, but active recruiting on Danish soil was illegal. German authorities disregarded this law and began recruiting efforts and ultimately 12,000 Danish citizens volunteered for German army duty of which 6,000 were approved for service. After the war, it was retroactively made illegal to have served in the German army and many of the returning soldiers given long prison sentences. Industrial production and trade was, partly due to geopolitical reality and economic necessity, redirected towards Germany. Many government officials saw expanded trade with Germany as vital to maintaining social order in Denmark. It was feared increased unemployment and poverty could lead to civil unrest which would result in a crackdown by the German authorities. The Danish government and King Christian X repeatedly discouraged sabotage and encouraged informing on the resistance movement, an activity some were sentenced to death for, after the war. The structure of the Danish unemployment system meant that unemployment benefits could be denied if jobs were available in Germany and this practice was widely followed resulting in an average of some 20.000 Danes working in German factories through the 5 years of the war. In return for these concessions, the Danish cabinet rejected German demands for legislation discriminating against Denmark's Jewish minority. Demands to introduce the death penalty were likewise rebuffed and so were German demands to allow German military courts jurisdiction over Danish citizens and demands for the transfer of Danish army units to German military use. Although the Estonian Self-Administration did not have complete freedom of action, it exercised a significant measure of autonomy, within the framework of German policy, political, racial and economic. Thus, the Directors exercised their powers pursuant to the laws and regulations of the Republic of Estonia, but only to the extent that these had not been repealed or amended by the German military command. The Director's position was voluntary. The Self-Administration's autonomy enabled it to maintain police structures that cooperated with the Germans in rounding up and killing Jews and Roma and in seeking out and killing Estonians deemed to be opponents of the occupiers, and it was ultimately incorporated into the Estonian Security Police and SD. It also extended to the unlawful conscription of Estonians for forced labor or for military service under German command. The Estonian Security Police and SD, the 286th, 287th and 288th Estonian Auxiliary Police Battalions, and 2.5–3% of the Estonian Omakaitse (Home Guard) militia units (approximately between 1,000 and 1,200 men) were directly involved in criminal acts, taking part in the rounding-up, guarding or killing of 400–1,000 Roma people and 6,000 Jews in the concentration camps in the Pskov region, Russia and the Jägala, Vaivara, Klooga and Lagedi camps in Estonia. Guarded by the above-listed formations, 15,000 Soviet POWs died in Estonia: some through neglect and mistreatment and some through execution. Waffen SS recruiting center in Calais, Northern France photographed shortly after liberation by the Allies. The Vichy government, headed by Marshal Philippe Pétain and Pierre Laval, actively collaborated in the extermination of the European Jews. It also participated in Porajmos, the extermination of Roma people, and in the extermination of other "undesirables." Vichy opened up a series of concentration camps in France where it interned Jews, Gypsies, homosexuals, political opponents, etc. Directed by René Bousquet, the French police helped in the deportation of 76,000 Jews to the extermination camps. In 1995, President Jacques Chirac officially recognized the responsibility of the French state for the deportation of Jews during the war, in particular the more than 13,000 victims the Vel' d'Hiv Roundup of July 1942, during which Laval decided, of his own volition (and without being requested by the occupying German authorities), to deport children along with their parents. Only 2,500 of the deported Jews survived the war. The 1944 Battle of Marseille was another event during which the French police assisted the Gestapo in a massive raid, which included an urban reshaping plan involving the destruction of a whole neighbourhood in the popular Old Port. Some few collaborators were tried in the 1980s for crimes against humanity (Paul Touvier, etc. ), while Maurice Papon, who had become after the war prefect of police of Paris (a function in which he illustrated himself during the 1961 Paris massacre) was convicted in 1998 for crimes against humanity. He had been Budget Minister under President Valéry Giscard d'Estaing. Other collaborators, such as Emile Dewoitine, managed to have important functions after the war (Dewoitine was eventually named head of Aérospatiale, the firm which created the Concorde plane). Debates concerning state collaboration remain, in 2008, very strong in France. French workers at naval bases provided the Kriegsmarine with an essential workforce, thereby supporting Nazi Germany in the Battle of the Atlantic. By 1939, the Kriegsmarine's planning had presumed that they had time to build up resources before war started. When France fell and the ports of Brest, Lorient and St Nazaire became available, there were insufficient Germans to man these repair and maintenance facilities, so huge reliance was made on the French workforce. At the end of 1940, the Kriegsmarine requested 2,700 skilled workers from Wilhemshaven to work in bases on the Atlantic coast, but this was out of a total available workforce of only 3,300. This same request included 870 men skilled in machinery and engine building, but there were only 725 people with these skills in Wilhemshaven. This massive deficit was made up with French naval dockyard workers. In February 1941, the naval dockyard at Brest had only 470 German workers, compared with 6,349 French workers. In April 1941, French workers replaced defective superheater tubes on the Scharnhorst, carrying out the work slowly but, in the opinion of Scharnhorst's captain, to a better standard than could be obtained in the yards in Germany. An assessment commissioned by Vizeadmiral Walter Matthiae in October 1942 of the potential effect of withdrawal of French dockyard workers (considered possible after 32 French fatalities in an air raid at Keroman Submarine Base) stated that all repairs on the surface fleet would cease and U-boat repairs would be cut by 30 per cent. Admiral Darlan stated, on 30 September 1940, that it was useless to decline German requests for collaboration. In September 1942, Rear Admiral Germain Paul Jardel, commander of the French navy in the occupied zone stated "We have a special interest in that the workers at our arsenals work, and that they work in the arsenals and not in Germany." From a practical point of view, French workers needed employment and could be conscripted to work in Germany (as happened to nearly a thousand of them). A small number objected to carrying out war work but the majority were found by the Germans to be willing and efficient workers. Légion des Volontaires fighting with the Axis on the Russian front. The French volunteers would form the Legion of French Volunteers Against Bolshevism (LVF), Legion Imperiale, SS-Sturmbrigade Frankreich and finally in 1945 the 33rd Waffen Grenadier Division of the SS Charlemagne (1st French), which was among the final defenders of Berlin. Breton nationalists such as Olier Mordrel and François Debeauvais had longstanding links with Nazi Germany because of their fascist and Nordicist ideologies, linked to the belief that the Bretons were a "pure" Celtic branch of the Aryan-Nordic race. At the outbreak of the war they left France and declared support for Germany. After 1940, they returned and their supporters such as Célestin Lainé and Yann Goulet organized militias that worked in collaboration with the Germans. Lainé and Goulet later took refuge in Ireland. On 22 September 1940, an agreement was signed Between Vichy and the Japanese, which allowed the Japanese to station no more than 6,000 troops in Indochina, and never have more than 25,000 transiting the colony. Rights were given for three airfields, with all other Japanese forces forbidden to enter Indochina without Vichy consent. Vichy signed Joint Defense and Joint Military Cooperation treaty with Japan on 29 July. It granted the Japanese eight airfields, allowed them to have more troops present, and to use the Indochinese financial system, in return for a fragile French autonomy. The French colonial government had largely stayed in place, as the Vichy government was on reasonably friendly terms with Japan. The Japanese permitted the French to put down nationalist rebellions in 1940. 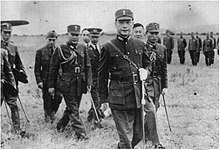 The Japanese occupation forces kept the French Indochina under nominal rule of Vichy France until March 1945, when the French colonial administration was overthrown, and the Japanese supported the establishment of Empire of Vietnam, Kingdom of Kampuchea and Kingdom of Laos as Japanese puppet states. Vietnamese militia were used to assist the Japanese. In Cambodia, the ex-colonial Cambodian constabulary was allowed to continue its existence, though it was reduced to ineffectuality. A plan to create a Cambodian volunteer force was not realized due to Japanese surrender. In Laos, the local administration and ex-colonial Garde Indigene (Indigenous Guard, a paramilitary police force) were reformed by Prince Phetsarath who replaced its Vietnamese members with Laotians. The German Wehrmacht forces in North Africa established the Kommando Deutsch-Arabische Truppen; which comprised two battalions of Arab volunteers of Tunisian origin, an Algerian battalion and a Moroccan battalion. The four units made up a total of 3,000 men; with German cadres. Adolf Hitler's portrait in the Konstamonitou Monastery on Mount Athos, Greece. Hitler was proclaimed the protector of the mountain by the locals after Wehrmacht units intervened in Bulgarian robberies with lethal force. After the German invasion of Greece, a Nazi-held government was put in place. All three quisling prime ministers, (Georgios Tsolakoglou, Konstantinos Logothetopoulos and Ioannis Rallis), cooperated with the Axis authorities. Although their administrations did not directly assist the occupation forces, they collaborated with the German forces, creating armed "anti-communist" and "anti-gangster" paramilitary organisations such as the Security Battalions and others. Greek National-Socialist parties, like the Greek National Socialist Party of Georgios Merkouris, the ESPO organization or openly anti-semitic organisations, like the National Union of Greece, helped German authorities fight the Resistance, and identify and deport Greek Jews. It was also the Organization BUND, with her leader Aginor Giannopoulos, who trained a battalion of Greek Volunteers, who fought with German Uniforms in SS and in Brandenburgers. (German special units). About one thousand Greeks from Greece and more from the Soviet Union, ostensibly avenging their ethnic persecution from Soviet authorities, joined the Waffen-SS, mostly in Ukrainian divisions. A special case was that of the infamous Ukrainian-Greek Sevastianos Foulidis, a fanatical anti-communist who had been recruited by the Abwehr as early as 1938 and became an official of the Wehrmacht, with extensive action in intelligence and agitation work in the Eastern front. During the Axis occupation, a number of Cham Albanians set up their own administration and militia in Thesprotia, Greece, subservient to the Resistance Balli Kombëtar organization, and actively collaborated first with the Italian and, subsequently, the German occupation forces, committing a number of atrocities. In one incident, on 29 September 1943, Nuri and Mazzar Dino, Albanian paramilitary leaders, instigated the mass execution of all Greek officials and notables of Paramythia. Hong Kong was a British crown colony before its occupation by Japanese. During the Japanese rule, former members of the Hong Kong Police including the Indians and Chinese were recruited into a reformed police called the Kempeitai with new uniforms. Troops of the Legion Freies Indien, France, February 1944. Among Indonesians to receive Japanese imperial honours from Hirohito in November 1943 were Sukarno and Mohammad Hatta. Sukarno actively recruited and organised Indonesian Romusha forced labour. They succeeded respectively to become the founding President of the Republic of Indonesia and Vice President of the Republic of Indonesia in August 1945. Latvian Auxiliary Police assemble a group of Jews, Liepāja, July 1941. In the days before the capture of Riga by German forces the deportations and murders of Latvians by the Soviet NKVD had reached their peak. Those that the NKVD could not deport in time before the arrival of the Germans were shot in the Central Prison. RSHA's instructions to their agents to unleash pogroms fell on fertile ground. After the entry of Einsatzkommando 1a and part of Einsatzkommando 2 into the Latvian capital contact between Viktors Arajs and Brigadeführer Walter Stahlecker was established on 1 July. Stahlecker instructed Arajs on that same day to set up a commando unit that obtained an official name Latvian Auxiliary Security Police or Arājs Kommando. The group was composed of students and former officers of far-right wing orientation; all the members of this group were volunteers, and free to leave at any time. The following day on 2 July Arajs learned from Stahlecker during a conference that the Arajs commando had to unleash a pogrom that looked spontaneous and these pogrom-like disorders were to break out before German occupation authorities had been properly established. The Einsatzkommando influenced mobs of former members of Pērkonkrusts and other extreme right-wing groups began mass arrests, pillaging and murders of Jews in Riga, which led to death of between 300 and 400 Jews. Killings continued under the supervision of SS Brigadeführer Walter Stahlecker and ended when more 2,700 Jews had been murdered. The activities of the Einsatzkommando were constrained after the full establishment of the German occupation authority, after which the SS made use of select units of native recruits. German General Wilhelm Ullersperger and Voldemar Weiss, a well known Latvian nationalist, appealed to the population via a radio address to attack "internal enemies". During the next few months, activities of the Latvian Auxiliary Security Police was primarily focused on killing Jews, Communists and Red Army stragglers in Latvia as well as in neighboring Belorussia. The group alone murdered almost half of Latvia's Jewish population, about 26,000 Jews, mainly in November and December 1941. The creation of the Arajs Kommando was "one of the most significant inventions of the early Holocaust", that marked a transition from German organised pogroms to systematic killing of Jews by local volunteers (former army officers, policemen, students, Aizargi). This helped resolve a chronic problem with German personnel shortages, and provided the Germans with relief from the psychological stress of routinely murdering civilians. By the autumn of 1941, the SS deployed Latvian 'Police Battalions' to Leningrad, where they were consolidated as Latvian Second SS Volunteer Brigade. In 1943, this brigade, which would later become the Latvian Nineteenth SS Volunteer Division, was consolidated with the Latvian Fifteen SS Volunteer Division to become the Latvian Legion. Although formally the Latvian Legion (Schutzmannschaft or Schuma) was a volunteer Waffen-SS military formation; it was voluntary only by name, because approximately 80-85% of personnel were conscripted into the legion. Prior to the German invasion, some leaders in Lithuania and in exile believed Germany would grant the country autonomy along the lines of the status of the Slovakia protectorate. German intelligence Abwehr believed it had control of the Lithuanian Activist Front, a pro-German organization based in the Lithuanian embassy in Berlin. The German Nazis allowed Lithuanians to form the Provisional Government, but did not recognize it diplomatically and did not allow Lithuanian ambassador Kazys Škirpa to become the Prime Minister. Once German military rule in Lithuania was replaced by a German civil authority, the Provisional Government was disbanded. Rogue units organised by Algirdas Klimaitis and supervised by SS Brigadeführer Walter Stahlecker started pogroms in and around Kaunas on 25 June 1941. Lithuanian collaborators would become involved in the murders of hundreds of thousands of Jews and Gypsies. Lithuanian-American scholar Saulius Sužiedėlis points to the increasingly antisemitic atmosphere clouding Lithuanian society, and the presence of antisemitic LAF émigrés who "needed little prodding from 'foreign influences'". Overall, he concludes that Lithuanian collaboration was "a significant help in facilitating all phases of the genocidal program . . . [and that] the local administration contributed, at times with zeal, to the destruction of Lithuanian Jewry". Elsewhere, Sužiedėlis has similarly emphasised that Lithuania's "moral and political leadership failed in 1941, and that thousands of Lithuanians participated in the Holocaust", though warned that, "[u]ntil buttressed by reliable accounts providing time, place and at least an approximate number of victims, claims of large-scale pogroms before the advent of the German forces must be treated with caution". In 1941, the Lithuanian Security Police (Lietuvos saugumo policija), subordinate to Nazi Germany's Security Police and Nazi Germany's Criminal Police, was created. Of the 26 local police battalions formed, 10 were involved in systematic extermination of Jews known as the Holocaust. The Special SD and German Security Police Squad in Vilnius killed tens of thousands of Jews and ethnic Poles in Paneriai (see Ponary massacre) and other places. In Minsk, the 2nd Battalion shot about 9,000 Soviet prisoners of war, in Slutsk it massacred 5,000 Jews. In March 1942 in Poland, the 2nd Lithuanian Battalion carried out guard duty in the Majdanek extermination camp. In July 1942, the 2nd Battalion participated in the deportation of Jews from the Warsaw ghetto to Treblinka death camp. In August–October 1942, the police battalions formed from Lithuanians were in Ukraine: the 3rd in Molodechno, the 4th in Donetsk, the 7th-в in Vinnitsa, the 11th in Korosten, the 16th in Dnepropetrovsk, the 254th in Poltava and the 255th in Mogilyov (Belarus). One of the battalions was also used to put down the Warsaw Ghetto Uprising in 1943. The Lithuanian Territorial Defense Force, composed of volunteers, was formed in 1944. Its leadership was Lithuanian, whereas arms were provided by Germans. The purpose of the Lithuanian Territorial Defense Force was to defend Lithuania against the approaching Soviet Army and to defend the civilian population in the territory of Lithuania form actions by partisans. In practice, it was primarily engaged in suppressing the Polish population and the Polish resistance; the LTDF disbanded after it was ordered to act under direct German command. Shortly before it was disbanded, the LTDF suffered a major defeat from Polish partisans in the battle of Murowana Oszmianka. The participation of the local populace was a key factor in the Holocaust in Nazi-occupied Lithuania which resulted in the near total destruction of Lithuanian Jews[a] living in the Nazi-controlled Lithuanian territories that would, from 17 July 1941, become the Generalbezirk Litauen of Reichskommissariat Ostland. Out of approximately 210,000 Jews, (208,000 according to the Lithuanian pre-war statistical data) an estimated 195,000–196,000 perished before the end of World War II (wider estimates are sometimes published); most from June to December 1941. The events that took place in the western regions of the USSR occupied by Nazi Germany in the first weeks after the German invasion (including Lithuania – see map) marked the sharp intensification of The Holocaust. Luxembourg was invaded by Nazi Germany in May 1940 and remained under German occupation until early 1945. Initially, the country was governed as a distinct region as the Germans prepared to assimilate its Germanic population into Germany itself. The Volksdeutsche Bewegung (VdB) was founded in Luxembourg in 1941 under the leadership of Damian Kratzenberg, a German teacher at the Athénée de Luxembourg. It aimed to encourage the population towards a pro-German position, prior to outright annexation, using the slogan Heim ins Reich. In August 1942, Luxembourg was annexed and became a region of Nazi Germany, meaning that Luxembourgers were given the same legal obligations as German citizens. Luxembourgish men were conscripted into the German military. The invading Japanese reorganized former British colonial police, and created a new auxiliary police. Later a 2000-men strong Malay Volunteer Army and a part-time Malay Volunteer Corps were created. Local residents were also encouraged to join Japanese Army as auxiliary 'Heiho'. There was a Railway Protection Corps as well. During the Nazi occupation of Monaco, the Monaco police arrested and turned over 42 Central European Jewish refugees to the Nazis while also protecting Monaco's own Jews. SS Recruiting Poster for the Netherlands, urging Dutch people to "join the fight against Bolshevism"
The Germans reformed pre-war Dutch police and established a new Communal Police, which helped Germans fight resistance and deport Jews. 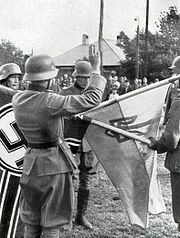 The Dutch Nazi Party had its own militia units, whose members were transferred to other Paramilitaries like the Netherlands Landstorm or the Control Commando. Dutch Jew-hunters massively helped the Nazis. Thousands of Dutch volunteers joined the 11th SS Volunteer Panzergrenadier Division Nordland (created in February 1943). The division participated in fighting against the Soviet army and was crushed in the Battle of Berlin in April–May 1945. This was also the case for the 5th SS Panzergrenadier Division Wiking. It was involved in several major battles on the Eastern Front. SS-Freiwilligen Legion Niederlande, manned by Dutch volunteers and German officers, battled the Soviet army from 1941. In December 1943, it gained brigade status after fighting on the front around Leningrad. It was at Leningrad that the first European volunteer, a Dutchman, earned the Knight's Cross of the Iron Cross: Gerardus Mooyman. In December 1944, it was transformed into the 23rd SS Volunteer Panzergrenadier Division Nederland and fought in Courland and Pomerania. It found its end scattered across Germany. 49. SS-Freiwilligen-Panzergrenadier-Regiment "de Ruyter" fought at the Oder and surrendered on 3 May 1945 to the Americans. 48. SS-Freiwilligen-Panzergrenadier-Regiment "General Seyffardt" however was split up into two groups. The first of these fought with Kampfgruppe Vieweger and went under in the fighting near Halbe. The few remaining survivors were captured by the Soviets. The other half of "General Seyffart" fought with Korpsgruppe Tettau and surrendered to the western Allies. During the war famous actor and singer Johannes Heesters made his career in Nazi Germany, befriending high-ranking Nazis such as Joseph Goebbels and living in houses stolen from wealthy Jews. In Norway, the national government, headed by Vidkun Quisling, was installed by the Germans as a puppet regime during the occupation, while king Haakon VII and the legally elected Norwegian government was in exile. Quisling encouraged Norwegians to volunteer for service in the Waffen-SS, collaborated in the deportation of Jews, and was responsible for the executions of members of the Norwegian resistance movement. About 45,000 Norwegian collaborators joined the fascist party Nasjonal Samling (National Union), about 8,500 of them being enlisted in the collaborationist paramilitary organization Hirden. In addition, Norwegian police units like the Statspolitiet helped arrest many of Norway's Jews. Nasjonal Samling had very little support among the population at large and Norway was one of few countries where resistance during World War II was widespread before the turning point of the war in 1942/43. After the war, Quisling and other collaborators were imprisoned, fined or executed. Quisling's name has become an international eponym for traitor. The Second Philippine Republic was a puppet state established by Japanese invasion forces. The puppet state relied on reformed Bureau of Constabulary and the Makapili militia to fight the local resistance movement and regular troops of the Philippine Commonwealth Army. The president of the republic, José P. Laurel had his own presidential guard unit. When the Americans were closing in the Philippines in 1944, the Japanese began recruiting Filipinos to augment their losses. Most of the Filipino recruits were serving in the Imperial Japanese Army and were fighting actively until Japan's surrender. However, both the spies called "Makapili" and others suffer harsh treatment due to their works. Unlike the situation in other German-occupied European countries, where the Germans installed collaborationist authorities, in occupied Poland there was no puppet government. Poland as a polity never surrendered to the Germans, instead evacuating its government and armed forces via Romania and Hungary and by sea to allied France and Great Britain, while German-occupied Polish territory was either annexed outright by Nazi Germany or placed under German administration as the General Government. Shortly after the German invasion of Poland, the Nazi authorities ordered the mobilization of prewar Polish officials and the Polish police (the Blue Police), who were forced, under penalty of death, to work for the German occupation authorities. The primary task of the officials was to run the day-to-day administration of the occupied territories; and of the Blue Police, to act as a regular police force dealing with criminal activities. The Germans also used the Blue Police to combat smuggling and resistance and to round up (łapanka) random civilians for forced labor and to apprehend Jews (in German, Judenjagd, "hunting Jews"). While many officials and police reluctantly followed German orders, some acted as agents for the Polish resistance. The Polish Underground State's wartime Special Courts investigated 17,000 Poles who collaborated with the Germans; about 3,500 were sentenced to death. Some of the collaborators – szmalcowniks – blackmailed Jews and their Polish rescuers and assisted the Germans as informers, turning in Jews and Poles who hid them, and reporting on the Polish resistance. Many prewar Polish citizens of German descent voluntarily declared themselves Volksdeutsche ("ethnic Germans"), and some of them committed atrocities against the Polish population and organized large-scale looting of property. The Germans set up Jewish-run governing bodies in Jewish communities and ghettos – Judenräte (Jewish councils) that served as self-enforcing intermediaries for managing Jewish communities and ghettos; and Jewish ghetto police (Jüdischer Ordnungsdienst), which functioned as auxiliary police forces tasked with maintaining order and combating crime. The Germans used the Judenrats to register Jews for deportation to ghettos; and the Jewish ghetto police, to disrupt Jewish resistance in the ghettos and to facilitate deportation of Jews to German concentration camps. Additionally, Jewish collaborationist groups such as Żagiew and Group 13 worked directly for the German Gestapo, informing on Polish resistance efforts to save Jews. Portugal was neutral during the war, but its colony Timor was occupied by the Japanese. Local militiamen were organized into Black Columns to help Japanese forces fight Allies. During the Italian conquest of British Somaliland, local chief Afchar offered his men to fight alongside Italians against British forces. Joint Wehrmacht and Red Army parade in Brest at end of invasion of Poland. 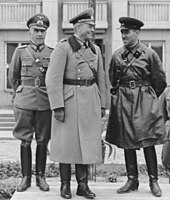 Center: Maj. Gen. Heinz Guderian. Right: Brig. Semyon Krivoshein. During German invasion of Poland and Western Europe (1939–1941) Soviet Union presented a friendly stance towards Germany with Molotov–Ribbentrop Pact, joint military parades, a number of German-Soviet commercial agreements and cooperation of NKVD and Gestapo in suppressing of resistance on the occupied territories. Following Operation Barbarossa Germany occupied large areas of western Soviet Union, parts of which remained under German control until late 1944. Soviet collaborators included numerous Russians, Ukrainians and members of other ethnic groups which inhabited the USSR. The Waffen-SS recruited from many nationalities living in the Soviet Union and the German government attempted to enroll Soviet citizens voluntarily for the OST-Arbeiter or Eastern worker program; originally this effort worked well, but the news of the terrible conditions they faced dried up the flow of new volunteers and the program became forcible. Although Turkic peoples had been perceived initially as "racially inferior" by the Nazis, this attitude officially already changed in autumn 1941, when, in view of the difficulties faced in their invasion of the Soviet Union, the Nazis attempted to harness the anti-Russian sentiment of Turkic peoples in Soviet Union for political gain. The first Turkestan Legion was mobilized in May 1942. The East Battalions contained between 275,000 and 350,000 "Muslim and Caucasian" volunteers and conscripts. Commanders of Russian National Liberation Army, which committed many war crimes during Warsaw Uprising, August 1944. They were hanged in the Soviet Union in 1946. In Russia proper, ethnic Russians were allowed to govern the Lokot Republic, an autonomous sector in Nazi-occupied Russia. Military groups under Nazi command were formed, such as the notorious S.S. Sturmbrigade R.O.N.A., infamous because of its involvement in atrocities in Belarus and Poland, and the 30th Waffen Grenadier Division of the SS (2nd Russian). Ethnic Russians also enlisted in large numbers into the many German auxiliary police units. Local civilians and Russian POWs, as well as Red Army defectors were encouraged to join the Wehrmacht as "hilfswillige". Some of them also served in so-called Ost battalions which, in particular, defended the French coastline against the expected Allied invasion. The Kalmykian Voluntary Cavalry Corps was a unit of about 5,000 Kalmyk Mongol volunteers who chose to join the Wehrmacht in 1942 rather than remain in Kalmykia as the German Army retreated before the Red Army. In May 1943, German General Helmuth von Pannwitz was given authorization to create a Cossack Division consisting of two brigades primarily from Don and Kuban Cossacks, including former exiled White Army commanders such as Pyotr Krasnov and Andrei Shkuro. The division however was then not sent to fight the Red Army, but was ordered, in September 1943, to proceed to Yugoslavia and fight Josip Broz Tito's partisans. In the summer of 1944, the two brigades were upgraded to become the 1st Cossack Cavalry Division and 2nd Cossack Cavalry Division. From the beginning of 1945, these divisions were combined to become XVth SS Cossack Cavalry Corps. Pro-German Russian forces also included the anti-communist Russian Liberation Army (ROA, Russian: POA: Русская Освободительная Армия), which saw action as a part of the Wehrmacht. On 1 May 1945, however, ROA turned against the SS and fought on the side of Czech insurgents during the Prague Uprising. Before World War II, the territory of modern Ukraine was divided primarily between the Ukrainian SSR of the Soviet Union and the Second Polish Republic. Smaller regions were part of Romania and Hungary. Only the Soviet Union recognised Ukrainian autonomy, and large numbers of Ukrainians, particularly from the East, fought in the Red Army. The negative impact of Soviet policies implemented in the 1930s was still fresh in the memory of Ukrainians. These included the Holodomor of 1933, the Great Terror, the persecution of intellectuals during the Great Purge of 1937–38, the massacre of Ukrainian intellectuals after the annexation of Western Ukraine from Poland in 1939, the introduction and implementation of collectivization. As a result, the population of whole towns, cities and villages greeted the Germans as liberators, which helps explain the unprecedented rapid progress of the German forces in the occupation of Ukraine. Even before the German invasion, the Nachtigall and Roland battalions were set up and trained as Ukrainian battalions in the Wehrmacht, and were part of the initial invading force. With the change in regime ethnic Ukrainians were allowed and encouraged to work in administrative positions with the auxiliary police, post office, and other government structures, taking the place of Russians and Jews. Soviet citizens had a page in their internal passports with information regarding their ethnicity, party status, military rank, service in the Soviet Army reserve, and information as to where they were to assemble in case of war. This document also contained markings regarding a citizens social status and reliability, (i.e., son of a kulak, party or Komsomol membership). Soviet POWs who were able to demonstrate Soviet unreliability, i.e., non-membership in the CPSU, Komsomol or be of a discriminated class were quickly released from the POW camps. Often they were offered administrative and clerical positions or encouraged to join local police units. Some were trained as camp guards, while others were encouraged (in some cases forced) to enlist to fight in anti-Soviet military divisions. During the period of occupation, Nazi-controlled Ukrainian newspaper Volhyn wrote that "The element that settled our cities (Jews) ... must disappear completely from our cities. The Jewish problem is already in the process of being solved. There is evidence of some Ukrainian participation in the Holocaust. The auxiliary police in Kiev participated in rounding up of Jews who were directed to the Babi Yar massacre. Ukrainians participated in crushing the Warsaw Ghetto Uprising of 1943 and the Warsaw Uprising of 1944 where a mixed force of German SS troops, Russians, Cossacks, Azeris and Ukrainians, backed by German regular army units—killed up to 40,000 civilians. The Ukrainian collaborationist forces were composed of an estimated number of 180,000 volunteers serving with units scattered all over Europe. The Ukrainian Liberation Army (Ukrainian: Українське Визвольне Військо, Ukrayins'ke Vyzvol'ne Viys'ko, UVV) was formed by the German Army in 1943 to collect the Ukrainian volunteer units that came into being during World War II. It was composed of former Ukrainian Hiwis, Ostbataillonen, and other Soviet prisoners of war (POWs) or volunteers. Headed by Ukrainian general Mykhailo Omelianovych-Pavlenko, the unit grew to the size of 50,000 by 1944 and peaked at some 80,000 towards the end of the war. The army comprised a collection of units scattered all over Europe. In April 1945, remnants of the UVV were attached to the Ukrainian National Army, commanded by general Pavlo Shandruk. On 18 September 1941 in Zhytomyr 3,145 Jews were murdered with the assistance of the Ukrainian People's Militia (Operational Report 106). In Korosten Ukrainian militia rounded up 238 Jews for liquidation (Operational Report 80) and carried out the killings by themselves – similar to Sokal, where on 30 June 1941 they arrested and executed 183 Jews. At times the assistance was more active. Operational Report 88 informs that on 6 September 1941 for example, 1,107 Jewish adults were shot by the German forces while the Ukrainian militia unit assisting them liquidated 561 Jewish children and youths. On 28 April 1943 German Command announced the establishment of the SS-Freiwilligen-Schützen-Division "Galizien". It has been accounted that approximately 83,000 people volunteered for service in the Division. The Division, was used in Anti-partisan operations in Poland, Czechoslovakia and Yugoslavia. During the Brody offensive and Vienna Offensive to fight the Soviet forces. Those that survived surrendered to the Allies and the bulk emigrated to the West, primarily England, Australia and Canada. In Belarus under German occupation, the local pro-independence politicians attempted to use the Nazis with the aim to reestablish an independent Belarusian state. A Belarusian representative body – the Belarusian Central Council – was created under German control in 1943 but did not receive any real power from the German administration and concentrated mainly on managing social issues and education. Belarusian national military units (the Belarusian Home Defence) were only created a few months before the end of the German occupation. Some Belarusian collaborators participated in various massacres of Jews and Belarusian villagers, however, most of these massacres had to be carried out by Baltic and Ukrainian collaborators because of a relatively small willingness of Belarusians to participate. Many of the Belarusian collaborators retreated with German forces in the wake of the Red Army advance. In January 1945, the 30th Waffen Grenadier Division of the SS (1st Belarussian) was formed from remainders of Belarusian military units. The division participated in a small number of combats in France but demonstrated active disloyalty to the Nazis and saw mass desertion. Ethnic Armenian, Georgian, Turkic and Caucasian forces deployed by the Nazis consisted primarily of Soviet Red Army POWs assembled into ill-trained legions. Among these battalions were 18,000 Armenians, 13,000 Azerbaijanis, 14,000 Georgians, and 10,000 men from the "North Caucasus." American historian Alexander Dallin notes that the Armenian Legion and Georgian battalions were sent to the Netherlands as a result of Hitler's distrust of them, many of which later deserted. According to author Christopher Ailsby, the Turkic and Caucasian forces formed by the Germans were "poorly armed, trained and motivated", and were "unreliable and next to useless". The Armenian Revolutionary Federation (the Dashnaks) were suppressed in Armenia when the Armenian Republic was conquered by the Russian Bolsheviks in 1920 and ceased to exist. During World War II, some of the Dashnaks saw an opportunity in collaboration with the Germans to regain Armenia's independence. The Armenian Legion under the leadership of Drastamat Kanayan participated in the occupation of the Crimean Peninsula and the Caucasus. On 15 December 1942, the Armenian National Council was granted official recognition by Alfred Rosenberg, the Reich Ministry for the Occupied Eastern Territories. The president of Council was Professor Ardasher Abeghian, its vice-president Abraham Guilkhandanian and it numbered among its members Garegin Nzhdeh and Vahan Papazian. Until the end of 1944 it published a weekly journal, Armenian, edited by Viken Shantn who also broadcast on Radio Berlin with the aid of Dr. Paul Rohrbach. The British territory of Straits Settlements became under Japanese occupation after the fiasco suffered by Commonwealth forces in the Battle of Singapore. The Straits Settlements Police Force came under the control of the Japanese and all vessels owned by the Marine Police were confiscated. Yugoslav Soldiers of unknown ethnicity with Šajkačas and Nazi Armbands, likely Volksdeutsche although some sources say they're ZBOR members. Prior to being invaded by Nazi Germany, the Yugoslav government was working on forging a pact with Germany. That pact was rejected by Yugoslav antifascists, who guided by general Dušan Simović demonstrated on 26 March 1941, and forced the government to withdraw. Angered by what he perceived as treason, Hitler invaded the Kingdom of Yugoslavia without warning on 6 April 1941. Eleven days later Yugoslavia capitulated. Although they are of German ethnicity, it is important to note that officially Yugoslavia was their country. Volksdeutsche collaborators were the most common in the former territory of Yugoslavia. They were the founding stone for the 7th SS Volunteer Mountain Division Prinz Eugen which later expanded to include other ethnic groups. Soldiers of the division are noted to have reportedly brutally punished civilians accused of, or proven to be working with partisans in both Occupied Serbia and the Independent State of Croatia, going so far as to level entire villages with no buildings being exempt from destruction. Due to the collaboration, Josip Broz Tito, leader of the post-war Communist regime, declared the rights of ethnic Germans to be null and seized all of their property as well as expelling hundreds of thousands of them with no fair trial. 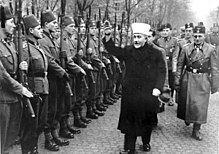 Haj Amin al-Husseini gives the Nazi salute while reviewing a unit of Bosnian SS volunteers in 1943 with Waffen SS General Sauberzweig. The 13th Waffen Mountain Division of the SS Handschar (1st Croatian), manned by Bosnian Muslims and commanded by German officers, was created in February 1943 and operated until December 1944. The division participated in anti-guerrilla operations in Yugoslavia. Ante Pavelić's puppet Independent State of Croatia was an ally of Nazi Germany. The Croatian extreme nationalists, Ustaše, killed thousands (around 100,000), primarily Serbs, in the Jasenovac concentration camp. The 13th Waffen Mountain Division of the SS Handschar (1st Croatian), created in February 1943, and the 23rd Waffen Mountain Division of the SS Kama, created in January 1944, were manned by Croats and Bosniaks as well as local Germans. Earlier in the war, Pavelić formed a Croatian Legion for the Eastern front and attached it to the Wehrmacht. Volunteer pilots were also joining the Luftwaffe as Pavelić did not want to get his army directly involved for both propaganda reasons (Domobrans/Home Guards were a "chieftain of Croatian values, never attacking and only defending") and due to a safeguard need for political flexibility with the Soviet Union. Pavelić sought to eliminate an inferiority complex among the leadership as well as attempt to get favoritism from the Germans by proclaiming Croats as descendants from Goths. The "Poglavnik" also stated that "Croats are not Slavs, but Germanic by blood and race". Nazi German leadership was indifferent to this claim. Serbian collaborationist organizations the Serbian State Guard and the Serbian Volunteer Corps, the party militia of the extreme right-wing Yugoslav National Movement "Zbor", lead by Dimitrije Ljotić, had over 30,000 members and helped guard and run concentration camps, and fought the Yugoslav Partisans alongside the Germans. There was over 1000 Serbs in the mainly Volksdeutsche Waffen-SS Prinz Eugen division by 1944. Civilians collaborated to deport Jews to work camps in The General Government, resulting in Serbia being the second fully "judenfrei" country in Europe. Most Chetniks in Yugoslavia collaborated with the Axis occupation to one degree or another in order to fight the rival Partisan resistance, whom they viewed as their primary enemy, by establishing modus vivendi or operating as "legalised" auxiliary forces under Axis control. Some units engaged in marginal resistance activities and avoided accommodations with the enemy. Over a period of time, and in different parts of the country, the Chetniks were drawn progressively into collaboration agreements: first with the Nedić forces in Serbia, then with the Italians in occupied Dalmatia and Montenegro, with some of the Ustaše forces in northern Bosnia, and after the Italian capitulation also with the Germans directly. While Chetnik collaboration reached "extensive and systematic" proportions, the Chetniks themselves referred to this policy of collaboration as "using the enemy". The Russian Protective Corps was an armed force composed of anti-communist White Russian émigrés that was raised in the German-occupied territory of Serbia during World War II. The Italian governorate of Montenegro was established as an Italian protectorate with the support of Montenegrin separatists known as Greens. The Lovćen Brigade was the militia of the Greens who collaborated with the Italians. Other collaborationist units included local Chetniks, police, gendarmerie and Sandžak Muslim militia. In Bulgaria-annexed Yugoslav Macedonia, the Ohrana was organized by the occupation authority as auxiliary security forces. In April 1943, Heinrich Himmler created 21st Waffen Mountain Division of the SS Skanderbeg (1st Albanian) manned by Albanian and Kosovo Albanian volunteers. By June 1944, the military value was deemed low in lieu of partisan aggression and by November 1944 it was disbanded. The remaining cadre, now called Kampfgruppe Skanderbeg, was transferred to the Prinz Eugen Division where they successfully participated in actions against Tito's partisans in December 1944. The emblem of the division was a black Albanian eagle. Balli Kombëtar was an Albanian nationalist and anti-communist organization which collaborated with the Axis Powers during their occupation of Greece and Yugoslavia. Their agenda was the creation of "Greater Albania". The Slovene Home Guard was a collaborationist force formed in September 1943 in the area of the Province of Ljubljana (then a part of Italy). It functioned like most collaborationist forces in Axis-occupied Europe during World War II, but had limited autonomy, and at first functioned as an auxiliary police force that assisted the Germans in anti-Partisan actions. Later, it gained more autonomy and conducted most of the anti-partisan operations in the Province of Ljubljana. Much of the Guard's equipment was Italian (confiscated when Italy dropped out of the war in 1943), although German weapons and equipment were used as well, especially later in the war. Similar, but much smaller units, were also formed in the Littoral (Primorska) and Upper Carniola (Gorenjska). The Channel Islands were the only British territory in Europe occupied by Nazi Germany during World War II. The policy of the Island governments, acting under instructions from the British government communicated before the occupation, was one of passive co-operation, although this has been criticised, particularly in the treatment of the few Jews in the islands. These measures were administered by the Bailiff and the Aliens Office. One Jew from Jersey died in a Jersey mental hospital during the war, three who had come to Guernsey were deported to France and from there were rounded up and sent to a camp and died. Following the liberation of 1945 allegations against those accused of collaborating with the occupying authorities were investigated. By November 1946, the UK Home Secretary was in a position to inform the UK House of Commons that most of the allegations lacked substance and only 12 cases of collaboration were considered for prosecution, but the Director of Public Prosecutions had ruled out prosecutions on insufficient grounds. In particular, it was decided that there were no legal grounds for proceeding against those alleged to have informed to the occupying authorities against their fellow-citizens. In Jersey and Guernsey, laws were passed to retrospectively confiscate the financial gains made by war profiteers and black marketeers, although these measures also affected those who had made legitimate profits during the years of military occupation. During the occupation, cases of women fraternising with German soldiers had aroused indignation among some citizens. In the hours following the liberation, members of the British liberating forces were obliged to intervene to prevent revenge attacks. The British Free Corps (German: Britisches Freikorps) was a unit of the Waffen SS during World War II consisting of British and Dominion prisoners of war who had been recruited by the Nazis. Research by British historian Adrian Weale has identified 54 men who belonged to this unit at one time or another, some for only a few days. At no time did it reach more than 27 men in strength. Although official Nazi policy barred non-Germans from joining the regular German army, the Wehrmacht, volunteers from most occupied countries and even a small number from some Commonwealth countries. were permitted to join the ranks of the Waffen SS and the auxiliary police (Schutzmannschaft). Overall, nearly 600,000 Waffen-SS members were non-German, with some countries such as Belgium and the Netherlands contributing thousands of volunteers. Various collaborationalist parties in occupied France and the unoccupied Vichy zone assisted in establishing the Légion des volontaires français contre le bolchevisme (LVF). This volunteer army initially counted some 10,000 volunteers and would later become the 33rd Waffen SS division, one of the first SS divisions composed mostly of foreigners. Following is a list of the 18 largest Waffen SS divisions composed mostly or entirely of foreign volunteers (note that there were other foreign Waffen SS divisions composed mostly of forced conscripts). Apart from frontline units, volunteers also played an important role in the large Schutzmannschaft units in the German-occupied territories in Eastern Europe. After Operation Barbarossa recruitment of local forces began almost immediately mostly by initiative of Himmler. These forces were not members of the regular armed forces and were not intended for frontline duty, but were instead used for rear echelon activities including maintaining the peace, fighting partisans, acting as police and organizing supplies for the front lines. In the later years of the war, these units numbered almost 200,000. By the end of World War II, 60% of the Waffen SS was made up of non-German volunteers from occupied countries. The predominantly Scandinavian 11th SS Volunteer Panzergrenadier Division Nordland division along with remnants of French, Italian, Spanish and Dutch volunteers were last defenders of the Reichstag in Berlin. The Nuremberg Trials, in declaring the Waffen SS a criminal organisation, explicitly excluded conscripts, who had committed no crimes. In 1950, The U.S. High Commission in Germany and the U.S. Displaced Persons Commission clarified the U.S. position on the Baltic Waffen SS Units, considering them distinct from the German SS in purpose, ideology, activities and qualifications for membership. The Japanese also recruited volunteers from a number of occupied regions and from among POW's. See also: Category:Jewish collaborators with Nazi Germany. Though Germany was trying to murder all Jews in the Holocaust, a minority of Jews chose to collaborate with the Germans. The collaborators included individuals such as Gestapo collaborators Abraham Gancwajch and Stella Kubler, concentration-camp kapos like Eliezer Gruenbaum, Judenrat (Jewish council) members and bosses such as Chaim Rumkowski, and organizations such as Żagiew or Group 13 in the Warsaw Ghetto. Similar Jewish individual and group collaborators of the Gestapo operated in other cities and towns across German-occupied Poland—Alfred Nossig in Warsaw, Józef Diamand in Kraków, Szama Grajer in Lublin. Around early 1940s, Gestapo has been estimated to have had around 15,000 Jewish agents in Poland. Jewish agents helped the Germans in return for limited freedom and other compensations (food, money) for the collaborators and their relatives. One of their assignments was to hunt down Jews who were in hiding; one of the most infamous cases involved about 2,500 Jews being lured out of hiding and subsequently captured by the Germans in the aftermath of the Hotel Polski affair in which Żagiew agents where involved. Jewish collaborators also informed Germany's Gestapo of Polish resistance, including on its efforts to hide Jews. and engaged in racketeering, blackmail, and extortion in the Warsaw Ghetto. During the war, some Jewish collaborators were executed by the Polish underground. After World War II, a number of others were tried in Jewish transition camps and in Israel, though none of them received sentences of more than 18 months' imprisonment. A number of international companies have been accused of having collaborated with Nazi Germany before their home countries' entry into World War II, though it has been debated whether the term "collaboration" is applicable to business dealings outside the context of overt war. American companies that had dealings with Nazi Germany included Ford Motor Company, Coca Cola, IBM, Brown Brothers Harriman & Co., and the Associated Press. In December 1941, when the United States entered the war against Germany, 250 American firms owned more than $450 million of German assets. Major American companies with investments in Germany included General Motors, Standard Oil, IT&T, Singer, International Harvester, Eastman Kodak, Gillette, Coca-Cola, Kraft, Westinghouse, and United Fruit. Many major Hollywood studios have also been accused of collaboration, in making or adjusting films to Nazi tastes. German financial operations worldwide were facilitated by banks such as the Bank for International Settlements, Chase and Morgan, and Union Banking Corporation. Robert A. Rosenbaum writes: "American companies had every reason to know that the Nazi regime was using IG Farben and other cartels as weapons of economic warfare"; and he notes that "as the US entered the war, it found that some technologies or resources could not be procured, because they were forfeited by American companies as part of business deals with their German counterparts." After the war, some of those companies reabsorbed their temporarily detached German subsidiaries, and even received compensation for war damages from the Allied governments. The Vichy government in France is one of the best known and most significant examples of collaboration between former enemies of Germany and Germany itself. When the French Vichy government emerged at the same time of the Free French in London there was much confusion regarding the loyalty of French overseas colonies and more importantly their overseas armies and naval fleet. The reluctance of Vichy France to either disarm or surrender their naval fleet resulted in the British destruction of the French Fleet at Mers-el-Kebir on 3 July 1940. Later in the war French colonies were frequently used as staging areas for invasions or airbases for the Axis powers both in Indo China and Syria. This resulted in the invasion of Syria and Lebanon with the capture of Damascus on 17 June and later the Battle of Madagascar against Vichy French forces which lasted for seven months until November the same year. Denmark's government cooperated with the German occupiers until 1943 and actively helped recruit members for the Nordland and Wiking Waffen SS divisions and helped organize trade and sale of industrial and agricultural products to Germany. In Greece, the three quisling prime ministers (Georgios Tsolakoglou, Konstantinos Logothetopoulos and Ioannis Rallis) cooperated with the Axis authorities. Agricultural products (especially tobacco) were sent to Germany, Greek "volunteers" were sent to work to German factories, and special armed forces (such as the Security Battalions) were created to fight along German soldiers against the Allies and the Resistance movement. In Norway the government successfully managed to escape to London but Vidkun Quisling established a puppet regime in its absence—albeit with little support from the local population. ^ "Collaboration". Ushmm.org. 6 January 2011. Retrieved 28 September 2011. ^ John A. Armstrong, "Collaborationism in World War II: The Integral Nationalist Variant in Eastern Europe", The Journal of Modern History, vol. 40, no. 3 (September 1968), pp. 396–410. ^ Bertram N. Gordon, Collaborationism in France during the Second World War, Ithaca, N.Y., Cornell University Press, 1980, ISBN 0801412633, 9780801412639, p. 18. ^ Monteath, Peter (2011). P.O.W. : Australian prisoners of war in Hitler's Reich. Sydney: Macmillan. pp. 340–342. ISBN 978-1-74261-008-5. ^ Callahan, M.P. (2004). Making Enemies: War and State Building in Burma. Singapore University Press. p. 76. ISBN 9789971692834. Retrieved 17 February 2017. ^ Rene Chavez (11 April 2015). "Slovakian & Czech Awards: Slovakian Eastern Front Award". Axis101.bizland.com. Retrieved 16 January 2016. ^ "The Tragic Destiny of Romeo Reisinger: Death a Few Hours before Liberation". vhu.cz. Army Museum. Retrieved 25 October 2017. ^ Jørgen Hæstrup, Secret Alliance: A Study of the Danish Resistance Movement 1940–45. Odense, 1976. p. 9. ^ Phil Giltner, "The Success of Collaboration: Denmark's Self-Assessment of its Economic Position after Five Years of Nazi Occupation," Journal of Contemporary History 36:3 (2001) p. 486. ^ Henning Poulsen, "Hvad mente Danskerne?" Historie 2 (2000) p. 320. ^ "Danmark og de jødiske flygtninge 1938–1945: Flygtningestop" (in Danish). Dansk Institut for Internationale Studier. Retrieved 12 September 2015. ^ "Anders Fogh siger undskyld" (in Danish). Berlingske tidende. Retrieved 12 September 2015. ^ Jerry Voorhis, "Germany and Denmark: 1940–45," Scandinavian Studies 44:2 (1972) p. 174. ^ Lidegaard 2003, p. 461. ^ "Statsminister Vilhelm Buhls Antisabotagetale 2 September 1942" (in Danish). Aarhus University. Retrieved 12 September 2015. ^ Frisch, Hartvig (1945). Danmark besat og befriet – Bind II. Forlaget Fremad. p. 390. ^ Jørgensen, Hans (1998). Mennesker for kul. Forlaget Fremad. p. 23. ISBN 9788755722019. ^ a b "Conclusions of the Estonian International Commission for the Investigation of Crimes Against Humanity. Phase II – The German Occupation of Estonia, 1941–1944" (PDF). ^ Hellwinkel, Lars (2014). Hitler's Gateway to the Atlantic: German Naval Bases in France 1940–1945 (Kindle ed.). Barnsley: Seaforth Publishing. p. passim. ISBN 978-1-84832-199-1. ^ Currey, C.B. (2005). Victory at Any Cost: The Genius of Viet Nam's Gen. Vo Nguyen Giap. Potomac Books. p. 100. ISBN 978-1-61234-010-4. Retrieved 17 February 2017. ^ "Cambodia – The Japanese Occupation, 1941–45". Country-data.com. December 1987. Retrieved 16 January 2016. ^ Sucheng Chan (27 April 1994). "The Japanese Occupation of Laos". Uniyatra.com. Retrieved 16 January 2016. ^ MSW (19 September 2015). "Imperial Russian Battleships I". Weapons and Warfare. Retrieved 16 January 2016. ^ Hermann Frank Meyer (2008). Blutiges Edelweiß: die 1. Gebirgs-Division im Zweiten Weltkrieg. Ch. Links Verlag. pp. 469–471. ISBN 978-3-86153-447-1. Retrieved 16 January 2016. ^ Carroll, John Mark. (2007). A concise history of Hong Kong. ISBN 0-7425-3422-7, ISBN 978-0-7425-3422-3. p 123-125, p 129. ^ "Indonesia – Facts, People, and Points of Interest". ^ a b c d e Angrick, Andrej; Klein, Peter (2009). The "Final Solution" in Riga: Exploitation and Annihilation, 1941–1944. Volume 14 of Studies on War and Genocide. pp. 65–70. ISBN 978-1-84545-608-5. ^ a b Breitman, Richard (Sep 1991). "Himmler and the 'Terrible Secret' among the Executioners". Journal of Contemporary History. Sage Publications. 26 (3/4): 431–451. doi:10.1177/002200949102600305. JSTOR 260654. ^ a b c Ruth Bettina Birn and Volker Riess (1997) Revising the Holocaust. The Historical Journal, Vol. 40, No. 1 (Mar. 1997), pp. 195-215. ^ Longerich, Peter (2010). Holocaust: The Nazi Persecution and Murder of the Jews. Oxford University Press. p. 194. ISBN 978-0-19-280436-5. ^ Brūvelis, Edvīns; et al. (2005). Latviešu leģionāri / Latvian legionnaires (in Latvian and English). Daugavas vanagi. OCLC 66394978. ISBN 9984-19-762-3. ^ "Arūnas Bubnys. Lietuvių saugumo policija ir holokaustas (1941–1944) | Lithuanian Security Police and the Holocaust (1941–1944)". genocid.lt. Retrieved 17 February 2017. ^ "Śledztwo w sprawie masowych zabójstw Polaków w latach 1941–1944 w Ponarach koło Wilna dokonanych przez funkcjonariuszy policji niemieckiej i kolaboracyjnej policji litewskiej" [Investigation of mass murders of Poles in the years 1941–1944 in Ponary near Wilno by functionaries of German police and Lithuanian collaborating police]. Institute of National Remembrance documents from 2003 on the ongoing investigation (in Polish). Archived from the original on 22 September 2008. Retrieved 10 February 2007. ^ (in Polish) Czesław Michalski, Ponary – Golgota Wileńszczyzny Archived 7 February 2007 at the Wayback Machine (Ponary – the Golgoth of Wilno Region). Konspekt nº 5, Winter 2000–2001, a publication of the Academy of Pedagogy in Kraków. Retrieved 10 February 2007. ^ Niwiński, Piotr (2011). Ponary : miejsce ludzkiej rzeźni (PDF). Warszawa: Instytut Pamięci Narodowej, Komisja Ścigania Zbrodni przeciwko Narodowi Polskiemu; Ministerstwo Spraw Zagranicznych Rzeczpospolitej Polskiej, Departament Współpracy z Polonią. pp. 25–26. Archived from the original (PDF) on 5 February 2012. ^ Sužiedėlis, Saulius (2004). Gaunt, David; Levine, Paul A.; Palosuo, Laura, eds. Collaboration and Resistance During the Holocaust: Belarus, Estonia, Latvia, Lithuania. Frankfurt am Main, Bern, New York: Peter Lang, and Oxford. p. 339. ^ Sužiedėlis, Saulius (2004). Gaunt, David; Levine, Paul A.; Palosuo, Laura, eds. Collaboration and Resistance During the Holocaust: Belarus, Estonia, Latvia, Lithuania. Frankfurt am Main, Bern, New York: Peter Lang, and Oxford. pp. 346, 348. ^ Sužiedėlis, Saulius (2001). "The Burden of 1941". Lithuanian Quarterly Journal of Arts and Sciences. 47 (4). ^ Krapauskas, Virgil (2010). "Book Reviews". Lithuanian Quarterly Journal of Arts and Sciences. 56 (3). ^ a b Arūnas Bubnys (2004). Vokiečių ir lietuvių saugumo policija (1941–1944) (German and Lithuanian security police: 1941–1944) (in Lithuanian). Vilnius: Lietuvos gyventojų genocido ir rezistencijos tyrimo centras. Retrieved 9 June 2006. ^ a b c Tadeusz Piotrowski (1997). Poland's Holocaust: Ethnic Strife, Collaboration with Occupying Forces and Genocide... McFarland & Company. pp. 165–166. ISBN 978-0-7864-0371-4. Retrieved 15 March 2008. ^ Peter Gessner (29 July 1942). "Life and Death in the German-established Warsaw Ghetto". Info-poland.buffalo.edu. Retrieved 28 September 2011. ^ Хлокост на юге Украины (1941–1944): (Запорожская область) [The Holocaust in the south of Ukraine (1941–1944): (Zaporizhia region)]. holocaust.kiev.ua (in Russian). 2003. Archived from the original on 27 August 2006. ^ Dov Levin (1996). "Lithuania". In David S. Wyman; Charles H. Rosenzveig. The World Reacts to the Holocaust. Johns Hopkins University Press. pp. 325–353. ISBN 978-0-8018-4969-5. Retrieved 16 January 2016. ^ "Heim ins Reich: La 2e guerre mondiale au Luxembourg – quelques points de repère". Centre national de l'audiovisuel. Archived from the original on 10 June 2007. ^ Kratoska, P.H. (1998). The Japanese Occupation of Malaya: A Social and Economic History. Hurst. p. 83. ISBN 978-1-85065-284-7. Retrieved 17 February 2017. ^ Michael Curtis (2002). Verdict on Vichy: Power and Prejudice in the Vichy France Regime. Arcade Publishing. p. 231. ISBN 978-1-55970-689-6. Retrieved 16 January 2016. ^ "Dutch Jew-hunters who massively helped the Nazis". Arutz Sheva. ^ "Nederlanderse-entertainer-sin-Duitsland". Die Welt (in Dutch). 17 April 2010. Retrieved 7 April 2011. ^ "American Experience – MacArthur – The Guerrilla War". PBS. 2009. Retrieved 16 January 2016. ^ jp:ラウエル大統領付親衛隊 (in Japanese). Horae.dti.ne.jp. Retrieved 16 January 2016. ^ The Contemporary Review. A. Strahan. 1942. Archived from the original on 3 May 2018. Retrieved 3 May 2018. ^ Lee, Lily Xiao Hong (16 September 2016). World War Two: Crucible of the Contemporary World – Commentary and Readings: Crucible of the Contemporary World – Commentary and Readings. Routledge. ISBN 978-1-315-48955-1. Archived from the original on 26 February 2018. Retrieved 14 March 2018. ^ a b Friedrich, Klaus-Peter (Winter 2005). "Collaboration in a 'Land without a Quisling': Patterns of Cooperation with the Nazi German Occupation Regime in Poland during World War II". Slavic Review. 64 (4): 711–746. doi:10.2307/3649910. JSTOR 3649910. ^ Piotrowski, Tadeusz (1998). Poland's Holocaust: Ethnic Strife, Collaboration with Occupying Forces and Genocide in the Second Republic, 1918–1947. McFarland. ISBN 978-0-7864-0371-4. Archived from the original on 26 February 2018. Retrieved 14 March 2018. ^ Steinhaus, Hugo (28 December 2015). Mathematician for All Seasons: Recollections and Notes Vol. 1 (1887–1945). Birkhäuser. ISBN 978-3-319-21984-4. Archived from the original on 26 February 2018. Retrieved 14 March 2018. ^ Adam Galamaga (21 May 2011). Great Britain and the Holocaust: Poland's Role in Revealing the News. GRIN Verlag. p. 15. ISBN 978-3-640-92005-1. Retrieved 30 May 2012. ^ Hugo Service (11 July 2013). Germans to Poles: Communism, Nationalism and Ethnic Cleansing After the Second World War. Cambridge University Press. p. 17. ISBN 978-1-107-67148-5. ^ Hempel, Adam (1987). Policja granatowa w okupacyjnym systemie administracyjnym Generalnego Gubernatorstwa: 1939–1945 (in Polish). Warsaw: Instytut Wydawniczy Związków Zawodowych. p. 83. ^ Grabowski, Jan (2014). Hunt for the Jews:Betrayal and Murder in German-Occupied Poland. Indiana University Press. ISBN 978-0-253-01074-2. ^ Gunnar S. Paulsson (2004). "The Demography of Jews in Hiding in Warsaw". The Holocaust: Critical Concepts in Historical Studies. London: Routledge. p. 118. ISBN 978-0-415-27509-5. ^ Hempel, Adam (1990). Pogrobowcy klęski: rzecz o policji "granatowej" w Generalnym Gubernatorstwie 1939���1945 (in Polish). Warsaw: Państwowe Wydawnictwo Naukowe. p. 435. ISBN 978-83-01-09291-7. ^ Connelly, John (2005). "Why the Poles Collaborated so Little: And Why That Is No Reason for Nationalist Hubris". Slavic Review. 64 (4): 771–781. doi:10.2307/3649912. JSTOR 3649912. ^ Marci Shore. "Gunnar S. Paulsson Secret City: The Hidden Jews of Warsaw 1940–1945". The American Association for Polish-Jewish Studies. Retrieved 17 February 2014. ^ Christopher R. Browning, The Origins of the Final Solution: The Evolution of Nazi Jewish Policy, September 1939–March 1942, 2007, p. 33. ^ a b Ringelblum, Emmanuel (6 November 2015). Notes From The Warsaw Ghetto: The Journal Of Emmanuel Ringelblum. Pickle Partners Publishing. ISBN 978-1-78625-716-1. Archived from the original on 18 March 2018. Retrieved 18 March 2018. ^ Hannah Arendt (2006). Eichmann in Jerusalem: A Report on the Banality of Evil. The Wannsee Conference, or Pontius Pilate. Penguin. pp. 117–118. ISBN 978-1-101-00716-7. Retrieved 16 June 2015. ^ Israel Gutman, The Jews of Warsaw, 1939–1943: Ghetto, Underground, Revolt, Indiana University Press, 1982, ISBN 0-253-20511-5, pp. 90–94. ^ Itamar Levin, Walls Around: The Plunder of Warsaw Jewry during World War II and Its Aftermath, Greenwood Publishing Group, 2004, ISBN 0-275-97649-1, pp. 94–98. ^ Frédéric Durand (6 November 2011). "Three centuries of violence and struggle in East Timor (1726–2008)". Online Encyclopedia of Mass Violence. Retrieved 16 January 2016. ^ "Guerra Mondiale (1940-8) – Inglesi in fuga – Il tricolore nel Somaliland" [World War II (1940-8) – British on the run – The Tricolour in Somaliland] (in Italian). Inilossum.com. Retrieved 16 January 2016. ^ Andrew Gregorovich. "InfoUkes: Ukrainian History -- World War II in Ukraine". infoukes.com. Retrieved 17 February 2017. ^ "30th Waffen Grenadier Division of the SS (2nd Russian)". panzer-reich.co.uk. Archived from the original on 19 March 2007. ^ Bauer, Yehuda: The Holocaust in its European Context Archived 24 October 2006 at the Wayback Machine p.14. Retrieved 14 January 2006." ^ Central Commission for Investigation of German Crimes in Poland. Archived 10 February 2007 at the Wayback Machine Excerpts from: German Crimes in Poland. Howard Fertig, New York, 1982. ^ Carlos Caballero Jurado (1983). Foreign Volunteers of the Wehrmacht 1941–45. Translated by Alfredo Campello, David List. Osprey. p. 29. ISBN 978-0-85045-524-3. ^ "Ukrainian Liberation Army (Ukrainske Vyzvolne Vijsko – UVV)". axis.ssgalicia.info. Archived from the original on 11 March 2014. Retrieved 17 February 2017. ^ Dr. Frank Grelka (2005). Ukrainischen Miliz. Die ukrainische Nationalbewegung unter deutscher Besatzungsherrschaft 1918 und 1941/42. Viadrina European University: Otto Harrassowitz Verlag. pp. 283–284. ISBN 978-3-447-05259-7. Retrieved 17 July 2015. RSHA von einer begrüßenswerten Aktivitat der ukrainischen Bevolkerung in den ersten Stunden nach dem Abzug der Sowjettruppen. ^ Dallin, Alexander. German Rule in Russia: 1941–1945. Octagon Books: 1990. ^ Auron. The Banality of Denial, p. 238. ^ Yair Auron (2003). The Banality of Denial. Transaction Publishers. p. 238. ISBN 978-1-4128-1784-4. Retrieved 16 January 2016. ^ "Remember Singapore – Mata. Mata: History of The Singapore Police". Remembersingapore.wordpress.com. 10 August 2013. Retrieved 16 January 2016. ^ Glišić, Venceslav (1970). ""TEROR" I "ZLOČINI" NACISTIČKE NEMAČKE U SRBIJI 1941-1945". znaci.net. Archived from the original on |archive-url= requires |archive-date= (help). ^ Pavlowitch 2007, p. 177. ^ Tomasevich 2001, pp. 498 and 501. ^ "List of Individual Victims of Jasenovac Concentration Camp". Official website of the Jasenovac Memorial Site. Retrieved 10 May 2016. ^ Беляков 2009, p. 146. ^ Barry M. Lituchy (2006). Jasenovac and the Holocaust in Yugoslavia: analyses and survivor testimonies. Jasenovac Research Institute. p. xxxiii. ISBN 9780975343203. "Both the Chetniks' political program and the extent of their collaboration have been amply, even voluminously, documented; it is more than a bit disappointing, thus, that people can still be found who believe that the Chetniks were doing anything besides attempting to realize a vision of an ethnically homogeneous Greater Serbian state, which they intended to advance, in the short run, by a policy of collaboration with the Axis forces. The Chetniks collaborated extensively and systematically with the Italian occupation forces until the Italian capitulation in September 1943, and beginning in 1944, portions of the Chetnik movement of Draža Mihailović collaborated openly with the Germans and Ustaša forces in Serbia and Croatia." ^ War and Revolution in Yugoslavia: 1941–1945 Archived 15 January 2016 at the Wayback Machine by Jozo Tomasevich. Google Books. ^ "Jersey Heritage Trust archive*". jerseyheritagetrust.org. Archived from the original on 10 May 2000. Retrieved 17 February 2017. ^ a b Weale, Adrian (1994). "British Free Corps in SS-Waffen – Myth and Historic Reality". australiarussia.com. Retrieved 18 May 2016. ^ Weale, Adrian (12 November 2014). Renegades – Appendix 5 British Members of the British Free Corps and their Aliases(Kindle Locations 3757-3758). Random House. Kindle Edition. ^ a b c d "Scholars: Polish PM distorts history by saying Jews participated in Holocaust". Archived from the original on 12 March 2018. Retrieved 12 March 2018. ^ a b Winstone, Martin (30 October 2014). The Dark Heart of Hitler's Europe: Nazi Rule in Poland Under the General Government. I.B.Tauris. p. 142. ISBN 978-1-78076-477-1. Archived from the original on 13 March 2018. Retrieved 12 March 2018. ^ Friling, Tuvia (2014-07-01). A Jewish Kapo in Auschwitz: History, Memory, and the Politics of Survival. Brandeis University Press. ISBN 978-1-61168-577-0. Archived from the original on 2018-03-13. Retrieved 2018-03-12. ^ Marrus, Michael Robert (1 January 1989). The Nazi Holocaust. Part 6: The Victims of the Holocaust. Walter de Gruyter. p. 254. ISBN 978-3-11-096873-6. Archived from the original on 2 March 2018. Retrieved 14 March 2018. ^ "Nossig, Alfred". jewishvirtuallibrary.org. Archived from the original on 2 March 2018. Retrieved 2 March 2018. ^ Dąbrowa-Kostka, Stanisław (1972). W okupowanym Krakowie: 6.IX.1939 – 18.I.1945 (in Polish). Wydaw. Min. Obrony Nar. p. 105. OCLC 923178628. Archived from the original on 2 March 2018. Retrieved 14 March 2018. ^ Radzik, Tadeusz (2007). Extermination of the Lublin ghetto (in Polish). Wydawn. Uniwersytetu Marii Curie-Skłodowskiej. p. 80. ISBN 9788322726471. Archived from the original on 2 March 2018. Retrieved 14 March 2018. ^ a b c Tadeusz Piotrowski (1998). Poland's Holocaust: Ethnic Strife, Collaboration with Occupying Forces and Genocide in the Second Republic, 1918-1947. McFarland. p. 74. ISBN 978-0-7864-0371-4. ^ Tadeusz Piotrowski (1998). Poland's Holocaust: Ethnic Strife, Collaboration with Occupying Forces and Genocide in the Second Republic, 1918-1947. McFarland. p. 67. ISBN 978-0-7864-0371-4. ^ Henryk Piecuch, Syndrom tajnych służb: czas prania mózgów i łamania kości, Agencja Wydawnicza CB, 1999, ISBN 83-86245-66-2, 362 pages. ^ "Jewish Honor Courts: Revenge, Retribution, and Reconciliation in Europe and Israel after the Holocaust – United States Holocaust Memorial Museum". ushmm.org. Archived from the original on 13 March 2018. Retrieved 12 March 2018. ^ a b Schuessler, Jennifer (25 June 2013). "Scholar Asserts That Hollywood Avidly Aided Nazis". The New York Times. ISSN 0362-4331. Archived from the original on 3 February 2018. Retrieved 20 March 2018. ^ English, Simon (2003-11-03). "Ford 'used slave labour' in Nazi German plants". ISSN 0307-1235. Archived from the original on 2018-03-20. Retrieved 2018-03-20. ^ "Mark Thomas discovers Coca-Cola's Nazi links". New Statesman. Archived from the original on 20 March 2018. Retrieved 20 March 2018. ^ "Coca-Cola collaborated with the Nazis in the 1930s, and Fanta is the proof". Timeline. 2 August 2017. Retrieved 20 March 2018. ^ Black, Edwin (27 February 2012). "IBM's Role in the Holocaust -- What the New Documents Reveal". HuffPost. Archived from the original on 29 October 2017. Retrieved 20 March 2018. ^ Black, Edwin. "How IBM Technology Jump Started the Holocaust". Gizmodo. Archived from the original on 21 March 2018. Retrieved 21 March 2018. ^ Black, Edwin (19 May 2002). "The business of making the trains to Auschwitz run on time". San Francisco Chronicle. Archived from the original on 28 March 2018. Retrieved 28 March 2018. ^ Campbell, Duncan (25 September 2004). "How Bush's grandfather helped Hitler's rise to power". The Guardian. Archived from the original on 15 March 2018. Retrieved 20 March 2018. ^ "What the AP's Collaboration With the Nazis Should Teach Us About Reporting the News". Tablet Magazine. Archived from the original on 20 March 2018. Retrieved 20 March 2018. ^ a b c d Oliver Stone; Peter Kuznick (15 October 2013). The Untold History of the United States. Simon and Schuster. p. 82. ISBN 978-1-4516-1352-0. ^ Robert A. Rosenbaum (20 July 2010). Waking to Danger: Americans and Nazi Germany, 1933–1941. ABC-CLIO. pp. 121–. ISBN 978-0-313-38503-2. Birn, Ruth Bettina, Collaboration with Nazi Germany in Eastern Europe: the Case of the Estonian Security Police. Contemporary European History 2001, 10.2, 181–198. Kitson, Simon (2008). The Hunt for Nazi Spies: Fighting Espionage in Vichy France. Chicago: University of Chicago Press. Williamson, Gordon (1994). The SS: Hitler's Instrument of Terror. Brown Packaging Limited. Rubenstein, Joshua; Altman, Ilya; Arad, Yitzhak, eds. (2010). The Unknown Black Book: The Holocaust in the German-Occupied Soviet Territories. Bloomington, IN: Indiana University Press. Lidegaard, Bo (2003). Dansk udenrigspolitiks historie. Overleveren – 1914–1945. Danmarks Nationalleksikon. ISBN 9788777890932. Hoffmann, Frank (2015). Berlin Koreans and Pictured Koreans (PDF). Koreans and Central Europeans: Informal Contacts up to 1950, vol. 1. Vienna: Praesens. ISBN 978-3-7069-0873-3. Wikimedia Commons has media related to Collaborators with Axis occupation.